If you haven’t filed your tax returns yet, this is the giveaway for you. I have an H&R Block Premium code ($74.95 value) to giveaway. This covers federal and state. 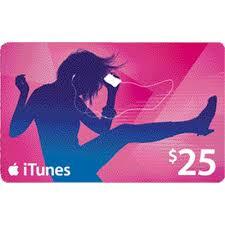 Just enter by leaving a comment letting me know you want it! I’ll choose a random winner on Friday. Contest is closed. 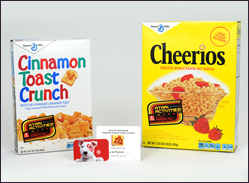 Update 3/30/13 The winner is Christine W.
Big G Cereals Going Retro & GIVEAWAY! Our family of 5 loves cereal so Big G is a big presence in our home. 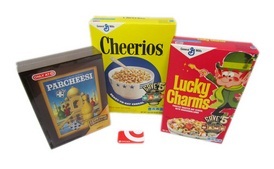 Big G cereals is again going “Retro” with special edition classic packaging from the 1950’s, ’60s and ’80s. For a limited time you can go to your local Target® store’s cereal aisle, as Big G cereals have brought back their “Retro” themed packaging. To help celebrate the event, Big G has team up with Hasbro®, offering a $5 coupon on Clue® Vintage, Scrabble® Vintage, Parcheesi® Vintage or Risk® Vintage board games at Target. Check out all the General Mills specials at Target. Don’t forget to go online & print a coupon for $1 off 2 General Mills cereals before you head to Target. Participating Hasbro vintage board games: Clue® Vintage, Scrabble® Vintage, Parcheesi® Vintage or Risk® Vintage. I know you all love cereal and you all love Target, so here’s a giveaway I know you’re going to be interested in! To enter this giveaway, simply leave one comment sharing which Big G cereal is your favorite. The giveaway entry period will end on April 1, 2013. Open to US residents. Winner will be selected with random.org. 4/2/13 Update: Thomas Murphy is the randomly selected winner. Oh how I love all things 80s…the music, the movies, the fashions, the Valley girl lingo (like, totally!). Now Target (also my favorite store) is bringing back retro packaging on Big G cereals. Big G cereals have partnered with Atari®, bringing classic ’80s games like Asteroids, Missile Command and Centipede to your breakfast table. Collect all 5 different packages that include totally radical Atari Activities on the back of each box; available exclusively at Target starting February through mid-March. It’s also Atari´s 40th Anniversary this year! Be sure to check out GrocerySavvy.com and test your online Atari gaming skills at Asteroids while also entering in a sweepstakes for chance to win Target gift cards and Atari merchandise. I’m so excited about this giveaway, because it combines my love of the ’80s, Target, and cereal! GIVEAWAY: One of my subscribers will receive 2 boxes of Big G cereals, a $10 Target gift card, and a free download for “Atari 80 Classic Games In 1”. To enter, you MUST subscribe to my blog via email (see top right). In ONE comment, tell me you subscribe and share with us one fun ’80s memory you have. Giveaway open to US only. Winner will be selected via random.org. Entry period ends at 6:00 PM Eastern Time on Monday, February 20, 2012. There are millions of Americans with lactose intolerance, and avoiding dairy can have health consequences. According to the National Institute of Health, when dairy is avoided, there are lower intakes of calcium and vitamin D in the diet, both of which are important bone building nutrients often found in dairy. Avoiding dairy can create higher risk for osteoporosis. February is National Lactose Intolerance Awareness Month, and Yoplait has announced its new Yoplait® Lactose Free yogurt just in time. Lactose Free comes in four delicious flavors – Strawberry, Peach, French Vanilla and Cherry – and contains 50% of the recommended Daily Value of calcium, with vitamins A and D in every cup. 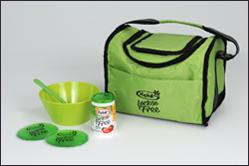 GIVEAWAY: One of my subscribers will win a Yoplait Lactose Free Prize Pack, which includes A VIP coupon to purchase Yoplait Lactose Free yogurt, a Lunch tote, 2 Gel packs, Individual bowl, and Spoon. To enter, you must be an email subscriber (see top right hand side of blog). In ONE comment, state you subscribe and tell me which of the flavors (Strawberry, Peach, French Vanilla or Cherry) you would like to try first. Giveaway open to US residents only. Entry period will end at 6:00 PM Eastern Time, Saturday, February 18, 2012. Disclosure: Prize pack, information, and giveaway have been provided by Yoplait through MyBlogSpark.